Sliding glass doors usually separate an outdoor deck area or sunroom from the rest of a home. They are common in homes around the world but feature various locking mechanisms to protect yourself and your property. You might want to unlock a sliding glass door before heading out on to the deck for the first warm day of summer or catching some quiet time in a sunroom. Exactly how you unlock a sliding glass door will depend on the make and model. Here are some basic guidelines for when you find yourself in an environment with a sliding glass door that your can't figure out how to unlock. 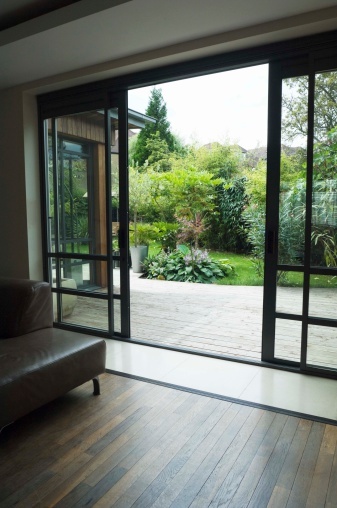 Sliding glass doors separate indoor and outdoor spaces but can be confusing and frustrating when locked. Look for a latch near the door's handle. Some models have a simple lever that is raised or lowered to lock or unlock the door. Move the latch up or down, depending on your model, to release the lock. Look for a lock at the top or bottom of the door. Some models have a lock that connects to the door frame at the top, bottom and sometimes both. You might be able to simply pull the locks open or you might require a key. Make sure all locks are released before attempting to open the door. Examine the frame of the door for keyholes or latches. Keyholes sometimes are found below or connected to the handle. Latches might be found near where your thumb would rest when gripping the handle, or on the frame of the door. Unlock any locks or lift any latches before trying to slide the door.